Louis van Gaal says he is yet to be fully tested. Romero has conceded just once in five games. MANCHESTER UNITED GOALKEEPER Sergio Romero is yet to prove he can command the club’s number one jersey, according to Louis van Gaal. The 28-year-old joined the club on a free transfer in July after his contract with Italian side Sampdoria expired, providing competition for Real Madrid target David de Gea, who is sitting out of first-team action. Romero has conceded just one goal in five outings for his new club – an own goal from Michael Carrick against Club Brugge – yet van Gaal says he is yet to be fully tested. “I don’t think so,” he told reporters when asked if his goalkeeper has proved his worth for the team. The Argentina international joined the club just 12 days before the start of the season and was thrust into their league opener against Tottenham, without playing a single pre-season fixture. Van Gaal has admitted they have been forced to rush him into the setup to help him settle into the team. He said: “He has played a lot of matches in the Argentina team in the Copa America. The difficulty was the co-operation between the new players and him. “We have had special training sessions with him. Not only with him and the goalkeeping coach [Frans Hoek] but also the players. Email “Louis van Gaal unsure if Sergio Romero will replace De Gea long-term”. 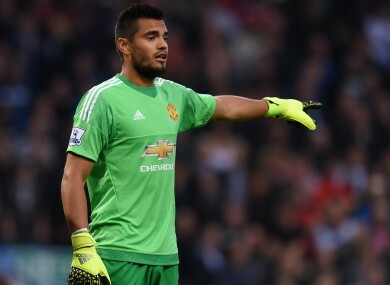 Feedback on “Louis van Gaal unsure if Sergio Romero will replace De Gea long-term”.